Ce studio est parfait pour le voyageur à faible clé qui cherchent à profiter d'une escapade à la mer authentique. Les clients sont accueillis par un personnel souriant et gâtés avec l'hospitalité de style familial qu'ils deviennent en dehors de la famille Abreu pendant leur séjour. Dès le moment où ils arrivent jusqu'au moment où ils quittent qu'ils peuvent attendre d'être personnellement comblés. Si vous souhaitez découvrir la cuisine locale délicieuse il ya une variété d'options situé à seulement quelques minutes de cette maison. Il est la boulangerie El Faro servant des pains frais chaudes et des pâtisseries, de la bouche d'arrosage empanadas en bas de la rue qui se marient bien avec votre café du matin, et enfin vous devez absolument prendre le temps de visiter BBQ Martin servant la meilleure cuisine portoricaine en ville. Si vous recherchez une expérience portoricaine authentique, c'est le choix parfait pour vous. Hmmm, what to say? ? ? If you want to experience a slice of real Puerto Rican life, this is a good place to do it. Ventana Atlantica is not a motel, but just a couple of rental units in a 'work-in-progress' household property which is under renovation.... starting at 8:30 am the two days we were there! 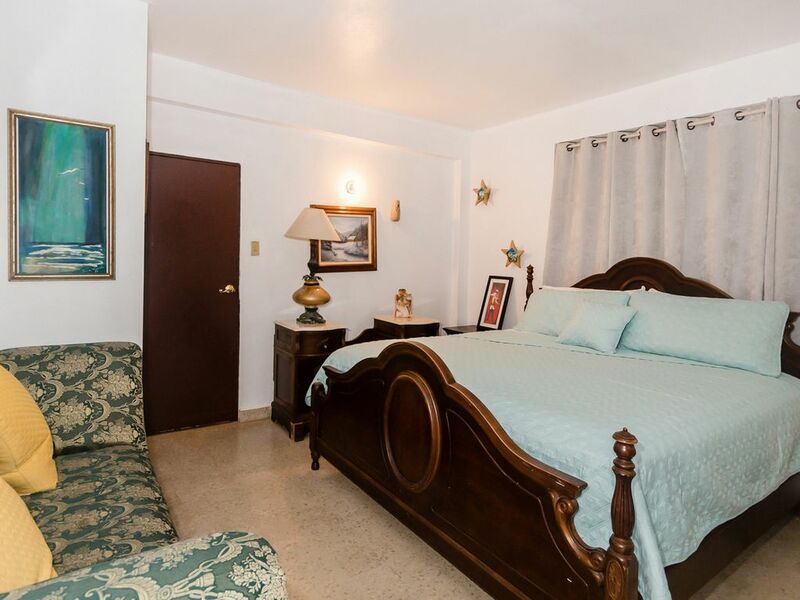 The photos used must be really old, as most of the property is run down, but our Room 130 was clean enough and furnished with well-used pieces from a regular home. Although worn and self-built, it had everything we needed to stay, cook and enjoy the gorgeous beach - walking, or from the lovely wooden deck across the expansive ocean side of the property. The surf looked too rough for swimming but a family was surf fishing one evening, and there's a swim beach towards Arecibo. At times there was traffic noise from the main road along the coast, car doors opening and closing right outside our window (which has only a slice of a view), voices, and a bit of barking from the family dog, construction and other noises, but it did make one feel a part of real life going on around us. We didn't use the pool, or gazebo; don't think the BBQ would actually work; just a property along the ocean road, so you don't feel in a community; also the comments about 'pampering' and being part of a family don't appear to be current. Regarding previous comments: property was very difficult to find, as there was NO sign of any kind. Get specific instructions in relation to mileage markers and physical signposts, and look carefully at the photographs of the entry on your booking site ( though building is structurally different, entry portal is the same). Get a local phone number for Angel to avoid a long distance call routed through the Florida number of the booking company. When we did reach Angel he was helpful, accommodating, and really great to deal with. For warm shower turn selector to 5:00 position instead of 11:00 (reverse installation). Angel is a kind, helpful, friendly host--the best asset to this rental! However, we found the kitchen and it's furnishings to be extremely lacking in cleanliness and supply. It's difficult to clean when there is only lukewarm water. There were very few utensils and even less pots and pans. We just used the refrigerator and microwave and ate on paper plates. There was no hot water in the shower the first night--Angel was happy to fix it the next day, but even then, the water was only lukewarm. After leaving some swim wear out in the rain, Angel helpfully washed and dried it for me while were were out. The setting is right on the ocean and there is a nice pool on the property also (although it was quite cool while we were there). If you're prepared to bring your own cleaning supplies and don't mind few kitchen supplies, this place could work for you.